Who raised Jesus from the dead? The SPIRIT did! The Holy Spirit of God raised Jesus from the dead! God raised Jesus, through the power of His Holy Spirit, who specifically accomplishes the will of God. And that very same Spirit will also raise us, from being dead in sin, IF we allow that Spirit to dwell in us. So then, one of the works, one of the jobs, of the Holy Spirit, was to raise Jesus from the dead. And also to raise us from being spiritually dead. Who makes us alive again, after we’ve been dead in sin? The Spirit of God makes us alive. Jesus said, in John 6:63; “It is the Spirit who gives life. The flesh profits nothing. The words that I have spoken to you are Spirit, and they are life.” It’s God’s will that we be made alive again; “Dead to sin, but alive to God..” (Romans 6:11) And it’s the role of the Holy Spirit, to accomplish that work of making us alive again. That’s talking about those who are dead in sin, and who “hear”, so to speak, the words of Jesus. Those who “hear” means those who are willing to obey the words of Jesus. But that verse says; “the dead shall hear His voice”. That’s not talking about literally “hearing” the sound of His voice. But rather, it’s talking about “receiving and obeying” the words, that His voice speaks. When those who are dead in sin, receive in faith, the words that Jesus has spoken, and receive the words that His Spirit has inspired, they shall be made alive again. The Holy Spirit, which is the power of God, raised Jesus from the dead. And that same power of God, is the One who puts spiritual life back into your mortal body, when you are baptized for the forgiveness of your sins. And He does it because of the fact that you’ve chosen to put His Spirit within you, and to allow that Spirit to dwell in you. And we’ll talk more about exactly HOW the Holy Spirit dwells in us, in one of our next lessons. Now, whose job is it, to raise all souls, in the resurrection of the last day? Four times, in the book of John, Jesus makes the statement; “..and I will raise him up again on the last day.” For example, we’ve already considered John 6:44, Jesus says; “No one can come to Me, unless the Father who sent Me, draws him; And I will raise him up again on the last day.” So then Jesus says that it is He who will raise everyone on the last day. What power will Christ use, to raise everyone on the last day? 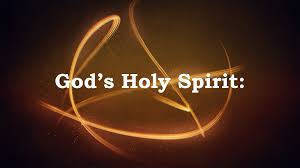 Obviously, He’ll use HIS power of HIS Holy Spirit, because the Holy Spirit IS the power of God. John 6:63 has told us that “..it is the Spirit who gives life.. the words that I have spoken to you ARE Spirit, and are life.” So then, is it the Holy Spirit, or Jesus the Word, who will raise us up on the last day? The answer is; It is the Spirit OF the Jesus the Word, who will raise us up. What have we already seen from scripture, concerning the Word, and the Son, and the Spirit? We’ve seen that they are all the same. And in the case of the resurrection on the last day, we see how sometimes, the “work” of the Son, and of the “work” of the Spirit, are the same. Just like the “work” of revealing the word of God, was shared by Jesus, and by His Holy Spirit, so will be the “work” of resurrecting the dead. We will be raised by the Son of God, through the power of the Holy Spirit of God. Here’s another “work” of the Holy Spirit. The Holy Spirit gives us blessings, according to the will of God. You know the verse in Romans 8:28; “And we know that God causes all thing to work together for good, to those who love God, to those who are called according to His purpose.” Once again, the Holy Spirit is the power of God, to accomplish the will of God. And the one causing all things to work together for our good, is the Holy Spirit of God. That’s one of the “works” that the Spirit accomplishes, according to God’s “purpose”. The phrase “with groanings” means.. “Along with groanings” In other words, the Spirit benefits us, “along with” His groanings. The “groanings” are not the “benefits” that the Spirit gives us. The Spirit’s “groanings” refers to the Spirit’s compassion towards us. That’s why the groanings ” are “not expressed in words”, because words can’t describe the compassion that God has for us. There ARE no words for it. To be perfectly accurate, the word “with” isn’t even in the original text. What it actually says is; “But the Spirit Himself benefits us; Groanings inexpressible”. “Inexpressible compassion”. Actions are what demonstrates the compassion of God. How did God demonstrate His love for us? He did it by sending His Son. That’s what John 3:16 says; “For God so loved the world, that He gave His only begotten Son, what whoever believes in Him, should not perish, but have everlasting life.” That’s the compassion that God has for us. The key to understanding Romans 8, verse 26, is to understand what the word “intercedes” means. Basically, when someone “intercedes” for someone else, they are stepping in, and doing something on behalf of that person. And that’s exactly what’s being said in this verse. The Spirit of God is “stepping in”, “in our behalf”, in order to accomplish something. Now, the Spirit of God, is God, right? The Spirit of God, is the power of God. The power of God, accomplishes the will of God. These are all things that the scriptures have been very clear about, in our study thus far. So then, God, is stepping in, on our behalf, and through the use of His very Spirit, He is accomplishing something for us. What is God accomplishing, and how is He accomplishing it? Since we don’t know which things are so beneficial to us, we don’t know which things to pray for. that’s our problem, and that’s the problem that God is going to help us overcome, through the use of His Spirit. So that answers one question; What is God going to accomplish? He’s going to help us overcome our problem of not knowing what we should be praying for. How is he going to overcome that problem? Is God going to pray to Himself, and ask Himself to give us what we need? No, He’s not going to do that, because God already knows what we need, and He knows what He wants us to have. God knows what is “necessary” for us to have, that which is according to His will. So what’s He going to do about it? He’s going to give us what we need. He’s going to give us exactly what he wants us to have! And how’s He going to do that? He’s going to use the power of His Holy Spirit, to give us what is necessary for us to have, the things which He desires for us to have. God is not going to pray to Himself, on our behalf. That doesn’t even sound logical does it? Well, He’s not going to do that. Instead, he’s going to give us what we need. Why, because He loves us! Some versions say; “..the Spirit intercedes for us..”, and some say; “..the Spirit makes intercession”. There’s a couple of different meaning for the original word. One meaning is.. “a chance meeting, during which you might converse”. But this is no “chance meeting”. This is the will of God we’re talking about here. so then, that meaning doesn’t apply. Answering your question now: hyperentychanei indeed seems to occur only once in ancient literature, specifically in Romans 8:26. I believe it’s a construct that St. Paul made on the spot, for the purposes of the meaning he wanted to get across. The verb entychano has various meanings, the most common of which is “I meet someone by chance”. Perhaps as a consequence of that, the meaning “I converse with someone” was developed. (For, if you meet someone on the street by chance, chances are that you’ll talk to him; and I say “him”, and not “her”, because you wouldn’t meet a woman on the street by chance in those times.) So, I surmise that St. Paul prefixed the preposition hyper- to it, because he was talking about the Holy Spirit “conversing” with the Father over (hyper) us humans, on our behalf. As you see, he uses the “over us” (hyper humon) explicitly afterwards, meaning “for us”. The whole expression, “conversing [with the Father] over us” can only be understood as “intercedes, on our behalf, for us”. That’s how I perceive it, in any case. But the meaning that I believe fits perfectly is this one.. “to come upon us with benefits.. to confer benefits upon us.” That’s the only time, that word is used in the new testament, and it means.. to give us the benefits that we need. It does NOT mean that the Holy Spirit offers up prayers to God the Father in our behalf. It does NOT mean to pray for us, it means to confer benefits upon us! Yes, I suppose “conferring the benefits in our behalf” is a possible interpretation. It doesn’t sound wrong to my ear. By the way, the same expression in used in the next verse (8:27), but without the hyper- in front of entynchanei (just noticed it), and it has the same meaning. I really think that the prefix hyper- in 8:26 is redundant. It’s even possible that some scribe added it later, without it being present in the original Pauline epistle. Just surmising. The word “intercede” does not mean.. to send prayers up to God, but it means.. to bring God’s blessings down to us. That’s a “work” of the Holy Spirit. God knows that we don’t know what’s best for us. He knows that “the way of man is not in himself” (Jeremiah 10:23) And so God, in His wisdom, and in His compassion, provides us with the benefits that we need, through His Holy Spirit. Now, I just want you to think about the interpretation, that claims that the Spirit of God, intercedes for us by praying to the Father in heaven. Some versions actually change the words of the verse to say; “But the Spirit prays for us..” And at least one version says; “But the Spirit pleads on our behalf..” These are simply not accurate translations. The idea is, that since we don’t now what to pray for as we should, because we don’t know our own needs, the Spirit is going to relay to the Father, and tell Him what we need. Isn’t that in itself a contradiction of scripture? And so ask yourself; What possible reason would there be, for the Spirit of God, who is God, to pray to the Father concerning our needs, when the Father already knows our needs? The scriptures also say, that the Spirit doesn’t even speak of His own initiative, but He speaks only what He hears from the Father.” (John 16, verse 13) And so, does it really sound reasonable, that the Spirit would be petitioning the Father on our behalf? There’s no need for that. But the Spirit does what there is a need for. The Spirit confers upon us the benefits that we need, and the benefits that the Father desires us to have. And so once again, it’s the Holy Spirit who accomplishes the will of God. Now, let me say this about the fact that God is one spiritual being, not three separate beings. And by the way, Deuteronomy 6:4 says; “Hear, O Israel! The Lord is our God! The Lord is ONE!” That’s very similar to James 2:19, which says; “You believe that ONE is God, you do well..” Here’s an interesting note about that verse; The word translated “One” is singular. It’s talking about the fact that God is one singular entity, one “being”. Now, if you believe what the scriptures say, that God is ONE being, then it is a bit illogical to think that the spirit of God, would be praying to Himself, in behalf of us. It’s only when you think that the Spirit is a totally separate being, that it would make any sense that the spirit would pray to the Father, in our behalf. And even that would be questionable, since the Father already knows what we need. But the fact is, that one misunderstanding, leads to another misunderstanding; Namely, misunderstanding that God is one being, leads to the misunderstanding that the Spirit would function as an intercessor in prayer, to the Father, as if to inform Him of our needs. Remember how I said that verse 26 was the only verse that used the specific word which was translated “intercedes”? Well, that is correct. The word in this verse, that’s translated as “intercedes”, is a different word. So then, we saw how the Holy Spirit “intercedes” for us, but how does Jesus “intercede” for us? Remember what Jesus said in Mathew 10, verses 32? He said; “Everyone therefore who will confess in Me before men, in him also I will confess before My Father who is in heaven.” That’s basically what’s being said in Romans 8:34. Jesus Christ the Son, is “at the right hand of God” in heaven. I’ve talked about how that phrase “at the right hand” is a figurative expression, and it refers to “the power of God”. Christ was raised BY the power of God, and He now is, THE power of God. Jesus said in Mathew 28:18; “All authority has been given to Me, in heaven and on earth.” And along with “all authority”, Jesus also received “all power”. Power and authority, go hand in hand. You don’t have “all” authority, unless you have the power that goes with it. So here you have Jesus Christ, the power of God, and he has all authority, to condemn, or to justify. And He is there in heaven “interceding”, for us. That’s what Romans 8:34 says; “interceding for us”. The word in this verse, which is translated “intercedes” is very similar to the word in verse 26, which is also translated “intercedes”. But here’s the difference. In verse 26, the word means.. “to confer benefits upon us, in line with God’s will”. But in verse 34, that word means.. “to light upon (or to meet with) for the purpose of consulting, or intervening, or making supplication.” In this verse, we have Jesus Christ, the Son of God, coming together with God the Father, for the purpose of intervening for us. What’s Jesus “intervening” with the Father about? He’s intervening about our salvation. He is confessing us before His Father who is in heaven, just like He said He’d do, in Mathew 10, verse 32. The context of this verse concerning Jesus “interceding for us”, can be seen from verses 31 thru 35. Listen to what’s being spoken of; “What then shall we say to these things? If God is for us, who is against us?” If Jesus confesses us before His Father, then no one can succeed against us! To summarize all this, on the one hand, we have the Holy Spirit of God, interceding for us, benefitting us, by conferring upon us the blessings that ae in line with the will of God, for His saints. And on the other have, we have the son of God I heaven, interceding for us, by confessing the fact that we belong to God! There fore no one can condemn us, and no one can stand against us, because God is the one who justifies. it’s just like the bible says in Romans 8, verse 1; “There is therefore now, no condemnation for those who are in Christ Jesus.” Why is there now no condemnation, because Jesus is confessing us before His Father in heaven. Do you understand how all this works? How God has designed all this? All of these related verses come together in complete harmony. But you can’t understand all this, unless you understand the meaning of some of these words, and you can’t really get a good grasp of it all, if you continue to believe that God is made up of separate beings. The reason that the works of the Father and the Son and of the Spirit come together so harmoniously, is because they are all one being, simply fulfilling separate roles. Once again, here are the last words of verse 26; “..with groanings not expressed in words”, is referring to God’s compassion. The word “groaning”, simply means “sighing”. And in this case, it’s a sigh of compassion, over our condition of not having the ability to know what’s best for us. But one of the “works” of the Holy Spirit of God, is to confer on us the benefits that we need, with the compassion of God; With “groanings”. Now let’s look at verse 27; “The one moreover, searching the hearts..” Who would that be? Who is the one searching the hearts? That’s God, isn’t it? That’s what Jeremiah 17, verse 10 says; “I the Lord, search the heart; I test the mind.” The word “mind” literally means.. “the most sensitive and vital part”. The Lord searches the “heart” of man, which is the most sensitive and vital part of man. Once again, verse 27; “The one moreover, searching the hearts.. (that’s God) ..knows what is the thoughts, of the Spirit (that’s the Holy Spirit) because (the Spirit) intercedes for the saints, down from God.” Your version might say; “according to God”. The specific meaning however, is “down from God”. The Spirit isn’t praying “up to God” in behalf of the saints; But rather, The Spirit is interceding with the saints, (in other words, conferring benefits to the saints) “down from God”. The Holy Spirit of God, is bringing something down from God, and conferring it with the saints, and delivering what God knows that we need. This is a “work” of the Holy Spirit; To deliver to the saints, what God knows we need; The things which will benefit us, as we lead a Christian life. And all of that is WHY it says in verse 28; “We know, moreover, that to those loving God, God works all things together, for good, to those who are called, according to (or, “down from”) His purpose.” The phrase “according to” comes from the word “ka-ta”, which literally means.. “down from”, from a higher plane, to lower plane.” And that is exactly how the Spirit “makes intercession”; It’s from God, and down to us. Next week, I think we may be ready to study from the bible, what it means to “receive the Holy Spirit”. There’s a lot of confusion about that, but the bibles make it fairly easy to understand, IF we take all of what the bible says, and put it all together, so that we get the whole picture. So that should be a good study, and an interesting study, and an informative study. Once again, IF we take the time to understand the words of the bible, and consider everything that is said on the subject, it all becomes so much easier to understand, and to harmonize. And the more we understand, the stronger our faith will become. Where does faith come from? From the word of God, right? “Faith comes by hearing the word of God.” Romans 10:17. ALL scripture is profitable, and NO scripture is not profitable! Can you get by not knowing some things that are revealed in the bible? Probably. But can your faith be as strong as it otherwise would be, if you knew everything? NO, it wouldn’t. And that’s why we keep “studying, to show ourselves approved unto God..” 2 Timothy 2:15.